So it's Easts v Manly in the GF but how did they get there? 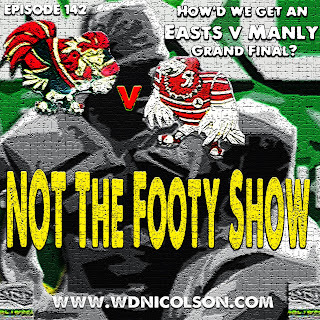 Dave and Waz reunite for a quick recap of Manly's win over Souths and Easts' dispatching Newcastle in the Preliminary Finals. 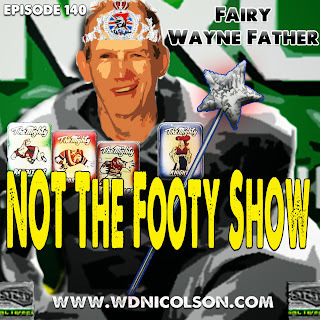 Plus we've got chats with Matt Hilder, Alex McKinnon and Robbie Rochow from the vanquished Knights. We also say goodbye to a champion in Danny Buderus and replay the Joey-Bedsey interview that was on Channel 9 before the game that is worth hearing if you missed it. We will have a One on One interview with James Maloney from the Roosters plus heaps of unique chats with Manly players from their GF Media Day on the next episode or two of NOT The Footy Show - Grand Final Week Editions. 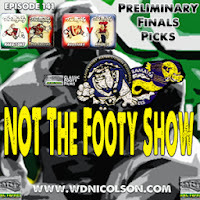 Our Picks for the Preliminary Finals - Souths v Manly and Easts v Newcastle. Mitch and Waz catch up at Newcastle's open training session on Friday to give you our predictions and for the rest of the show - listen to the audio from Classic Footy Films' new release: Highlights and Analysis of the 1998 Preliminary Final between Canterbury and Parramatta. We'll speak to you again after the games this weekend - so Sunday night. Relive the 1998 Preliminary Final... and that comeback via Classic Footy Films. [Q] FINALS QUESTION: Who is the last player to appear in a semi final game as his only appearance in the top grade for the season. And although his team won that game, he just wasn't picked again for the next semi final. Who is your tip for this weekend's Preliminary Finals - Our Picks are here or comment below or grab us on @NRLTweet to give us your prediction. There's nothing like a good Cinderella team at this time of year, but are Newcastle the real deal or about to get turned into a pumpkin by the Minor Premiers on Saturday night? In some ways I don't mind who makes the Grand Final. I was on Queensland radio on Thursday morning and although I'm leaning towards Souths and Easts facing off in the decider - I'd equally be happy with a Manly-Newcastle matchup. The other element that makes this Final 4 interesting is although Melbourne got beaten in straight sets - without them there's a certain unknown element amongst the teams left. 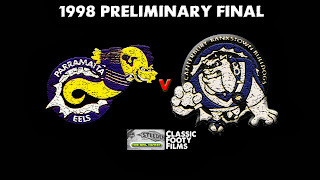 Now available on www.wdnicolson.com is our Special 30 minute Video Presentation of arguably the greatest Preliminary Final of them all - Canterbury v Parramatta from 1998. We have the key moments and our analysis of an utter classic. Enjoy. In the meantime sit back and enjoy the second and third last games of the season. Latest Episode 141 has our Prelim Picks 'on tape'! So our Tips for the Preliminary Finals are below and after crowning Johnathan Thurston as the @NRLTweet Player of the Year for 2013 - we brought back the @NRLTweet Player of the Finals Award - won by Cooper Cronk last year. You can track Finals Week 3 Votes via #NRLTweetPlayerofFinals and Voting Allocation is below (3 Voters per game in first three weeks, then 5 Voters for the Grand Final - all using 4-2-1 Votes) as is the rest of what you need for your weekend of Finals Footy. 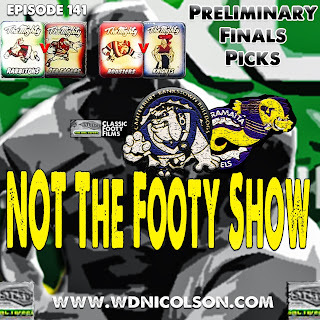 Latest of Late Mail and Preliminary Finals Tips below! 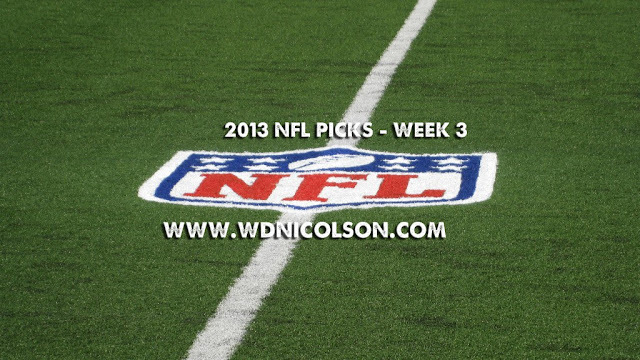 For our analysis of Tuesday team selections for Finals Week 3 - click here. WEEKLY RECAP: Week 3 was poor in Head to Head as we went 8-8, while with the Spread we dramatically improved to go 8-7 with a push in the TEN-SDG game. So we're barely above 60% now in H2H... the glorious days of season 2012 are well and truly behind us. But we persist! H2H LESSONS LEARNED: Kansas City are actually pretty good and I've thrown away 3 picks this year going against them every week... Philadelphia stink, teams without genuine QBs will find it hard to win when the other team plays well - ie. Tampa, Minnesota, while Pittsburgh just blew their last chance of me having any confidence in them by getting picked apart by Chicago (who are better than I thought). Bad losses for San Francisco, NY Giants and Buffalo but Seattle, New Orleans and Denver are in cruise control right now... New England still not sold on, despite them being my Super Bowl pick pre-season. Week 4 began with St Louis hosting San Francisco on Friday Morning Australian time - we didn't get these picks up on site til Friday arvo but our picks were in on the sites Thursday night - we had San Francisco giving 3.0 points and head to head. Advantage Top 4... the way it should be. If anyone you know is complaining about the Top 4 getting all the advantages in the Finals? Tell them to shut up now, because if you finish that high you should get every advantage you've EARNED. The Cowboys can moan all they want about this year's playoff departure (last year's was far worse in terms of a decision that cost them) but if they hadn't decided to wait til the last month a bit to play decent footy - they might have got a Top 4 berth and had a second chance after the refs stuffed up. The Dogs had a bad start and were mediocre for the rest of the season, so it makes sense they get bounced in the first week of the Finals. The Sharks and Knights earned their second chance this week, while Melbourne and Manly won 31 games between them out of 48 starts - so they certainly deserve a second bite at the cherry. So we get Elimination Finals this weekend - ENJOY and GET TO A GAME PLEASE! 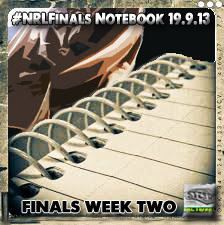 This Finals Week 2 Preview replaces the #NRLFinals Notebook for Thursday September 19 with a new #NRLFinals Notebook coming tomorrow. 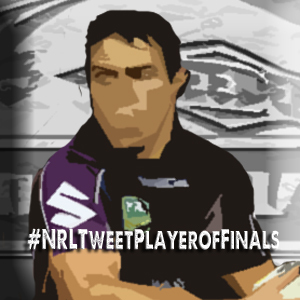 So our Tips for the Elimination Finals are below and after crowning Johnathan Thurston as the @NRLTweet Player of the Year for 2013 - we brought back the @NRLTweet Player of the Finals Award - won by Cooper Cronk last year. You can track Finals Week 2 Votes via #NRLTweetPlayerofFinals and Voting Allocation is below (3 Voters per game in first three weeks, then 5 Voters for the Grand Final - all using 4-2-1 Votes) as is the rest of what you need for your weekend of Finals Footy. Latest of Late Mail and Qualifying Finals Tips below! For our analysis of Tuesday team selections for Finals Week 2 - click here. WEEKLY RECAP: Week 2 was okay as Head to Head went 10-6, while with the Spread we improved from 4-11-1 to a 'standout' 6-10-0! So that puts us at about 66% success rate in Head to Head... you'd take that in the NRL these days. H2H LESSONS LEARNED: Indianapolis aren't as good as maybe we thought they might be after last year's playoff appearance, Kansas City have made a mockery of me picking against them both weeks, Washington stink, Arizona might not, Cleveland and Jacksonville should only be picked when playing each other... and then you pick Cleveland. San Diego get a road win... can they do it regularly? Pittsburgh are 0-2!!! Week 3 starts with Philadelphia hosting Kansas City (and former Eagles coach Andy Reid) on Friday Morning Australian time.